Wild bees are an increasingly important part of the “pollinator portfolio” for modern agriculture. We have ongoing studies on the role of wild bees as apple pollinators in New York state apple orchards. To date we have documented a surprising diversity of wild bees contributing to apple pollination in NY – over 120 species of wild, native bees have been collected visiting apple flowers in surveys of NY apple orchards over the past ten years. We have found that wild bees are more effective pollinators, on a per-bee basis, than honey bees and that wild bee abundance and species richness is impacted by both pesticides and loss of natural habitat. We recently developed a smartphone app that allows apple growers to collect data on wild bee abundances in their orchards and to share these data with us so that we can provide them with how best to manage their pollination needs. Over the past ten years, we have discovered a remarkably diverse native bee fauna in and around apple orchards in central New York. To date, we have collected 120 species of native bees in our surveys of more than 24 orchards ranging from Ithaca in the south to Lake Ontario in the north. Species of solitary, univoltine, ground-nesting bees (most importantly, Andrena) make up the bulk of our species and individuals. Other important genera include Bombus, Halictus, Lasioglossum, Osmia, and Colletes. In many orchards, native bees outnumber honey bees, suggesting that native bees are playing a key role in apple pollination. We are examining the factors that drive the species richness and abundance of native bees across our orchards, which vary widely in size and the surrounding natural habitat. Graduate student Mia Park is analyzing the impacts of natural habitat and pesticide use on both diversity and species richness across our 24 orchards. Native bee diversity responds positively to increased natural area around orchards and negatively to increased pesticide (especially fungicide) use. We have conducted a number of experiments over the past three years to determine whether the composition of the local bee fauna has a detectible impact on apple fruit and seed set. 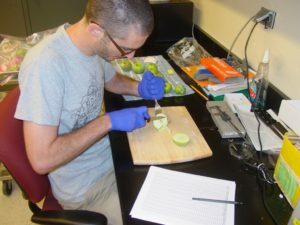 Post-doc EJ Blitzer is in the process of analyzing data from the period 2011-2013 that will help us identify how the native bee fauna directly impacts apple growers in terms of fruit set, seed set, and apple production. Preliminary results indicate that seed set increases with native bee species richness and abundance, but not with honey bee abundance. We are beginning a new project to investigate alternative host plants visited by bees collected on apples by identifying the pollen that they carry. This information will help us to quantify the degree of host-plant specialization of different bee species in the orchards, a possible indicator of their pollination effectiveness. 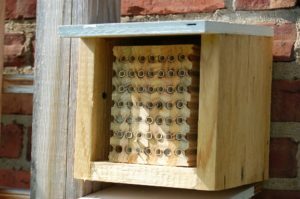 In addition, it will provide insight into the community of plants that these bees visit, which compete for bee visitation, and which support the growth of native bee populations. Post-doc Laura Russo is carrying out a broad survey of bee pollen loads from our over 10,000 bee specimens collected in apple orchards. Laura’s pollen reference library is now available online. In 2011 we started a project to examine the pesticide exposure to solitary, univoltine, mass-provisioning bees in apple orchards. 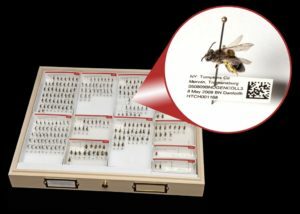 In collaboration with investigators from the University of Massachussets (Anne Averill), the University of Maine (Frank Drummond), and the Connecticut Agricultural Experiment Station (Brian Eitzer), we are using Osmia cornifrons as a “biomonitor” of pesticide exposure to wild bees in the apple agroecosystem. Our results have revealed a remarkable diversity of pesticides (including fungicides, herbicides, insecticides, and growth regulators) in pollen provision masses collected from nests in apple orchards under various management regimes. Postdoc EJ Blitzer is taking a lead role in analyzing these pesticide data. Thanks to funding from the Atkinson Center for a Sustainable Future, we have been able to extend our studies into the impacts of pathogens on wild bees in apple orchards. 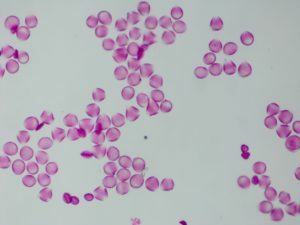 Using sophisticated methods for pathogen detection, we have been screening focal bee species for the presence of viral, bacterial, fungal, and microsporidian pathogens. We initially developed our screening methods based on pathogens known from honey bees, but have recently expanded our survey to include all potential viral and bacterial pathogens. Research Associate Shannon Hedtke has taken the lead on developing methods for pathogen detection. In 2009 (and again in 2012) we conducted a survey of the approximately 690 commercial apple growers in NY with the help of the National Agricultural Statistics Service, New York Field Office. Our survey included 24 questions related to grower practices and perceptions about native bees as pollinators. The majority of growers surveyed (85%) viewed native bees a significant pollinators in their orchards and many growers (68%) expressed willingness to adopt low-cost management practices for enhancing native bee diversity and abundance in their orchards. Overall, the view from orchard managers was extremely positive toward the contribution of native bees to apple pollination. For more information on our survey data, see the New York Fruit Quarterly, Spring 2010. These various projects are currently funded by a USDA-AFRI grant and a grant from the Atkinson Center for a Sustainable Future. This project involves an army of undergraduates and temporary technicians, two graduate students (Mia Park; mgp27[at]cornell.edu and Mary Centrella; mlc344[at]cornell.edu) and two post-docs (EJ Blitzer; ejb278[at]cornell.edu and Laura Russo; lr382[at]cornell.edu). 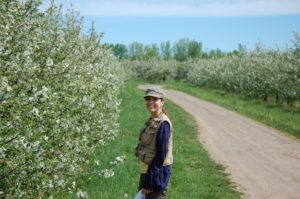 In collaboration with colleagues at Rutgers University (Ignasio Bartomeus and Rachael Winfree) and the New York State Agricultural Experiment Station (Alan Lakso), we examined the impact of climate change on the temporal synchrony of bees and apple flowering in central New York over a 46 year timeframe. When the most important apple pollinators were considered together, we found extensive synchrony between bee activity and the peak of apple bloom. Bee species showed different responses to shifting peak apple flowering times, with some species emerging earlier, some later, and some in synchrony with apple over time. However, the number of bee species in synchrony with apple remained stable over the 46 year timeframe of our study, indicating that biodiversity can buffer the impacts of climate change on agriculturally important plant-pollinator interactions. 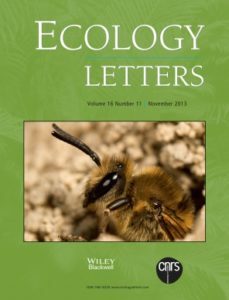 Our study was highlighted in the November, 2013 cover of Ecology Letters (figure above).